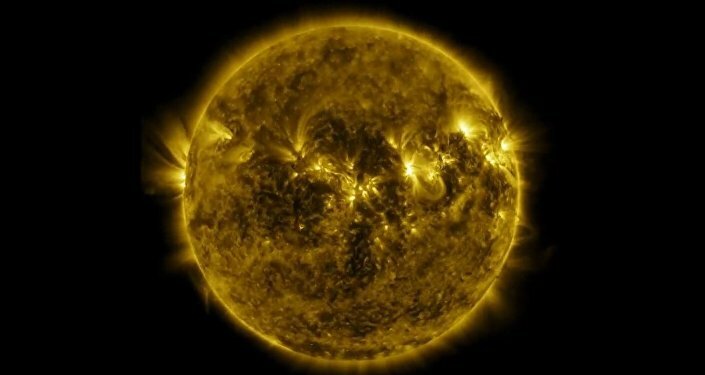 The National Aeronautics and Space Administration has published stunning video online showing a timelapse of Mercury passing in front of the Sun, showcasing the first time a Mercury transit of the Sun has been captured by an orbiting satellite. NASA posted the video on Monday, showing Mercury, the innermost planet of the Solar System, passing in front of the Sun, a rare event that happens only a few times a century. Remarkably, this is the first time the transit has been captured on video, thanks to the new Solar Dynamics Observatory (SDO), a satellite launched into orbit in 2010. The key feature of the posted time-lapse video is a set of different wavelengths in which the transit was recorded, providing very different imagery of the Sun. The various channels allow multiple processes happening at unique points of the star to be observed. In the video, as filters are switched from one channel to the next, viewers can see the Sun as a crimson inferno, as a golden cloud-like substance, and as an almost-solid yellow disc. The SDO gathers data on how the Sun physically influences Earth. To understand the volumes of information involved, the observatory sends an image every 12 seconds, equaling about 3 terabytes of data every 24 hours. Some 2600 terabytes of data have been gathered over the first five years of the observatory's life. The SDO can acquire imagery in 12 spectrums, including visible light, ultraviolet and x-ray. The full set of spectrums can be found at the corresponding NASA webpage.